The Amazon Tall Tower Observatory (ATTO) is a flagship long-term measurement station at a pristine location in the center of the Amazon rainforest, 160 km northeast of Manaus. It consists of a 325-meter tower and several 80-meter towers with instrumentation for meteorological, micrometeorological, trace gas, and aerosol measurements. At the ATTO site, studies on a wide range of topics – including trace gas chemistry, greenhouse gas measurements, aerosol chemistry and microphysics, biosphere–atmosphere exchange fluxes, micrometeorology, and ecology – have been conducted since its inception in early 2012. The special issue is open to articles discussing results from these studies; papers on research at related sites in central Amazonia are also welcome. Biomass burning emits light-absorbing aerosol particles that warm the atmosphere. One of them is the primarily emitted black carbon, which strongly absorbs radiation in the visible and UV spectral regions. Another one is the so-called brown carbon, a fraction of organic aerosol particles that are able to absorb radiation, especially in the UV spectral region. The contribution of both kinds of aerosol particles to light absorption over the Amazon rainforest is studied in this paper. This study uses satellite observations to track volcanic emissions in eastern Congo and their subsequent transport across the Atlantic Ocean into the Amazon Basin. 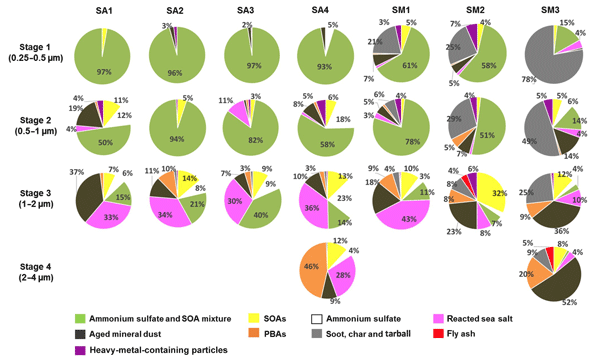 Aircraft and ground-based observations are used to characterize the influence of volcanogenic aerosol on the chemical and microphysical properties of Amazonian aerosols. 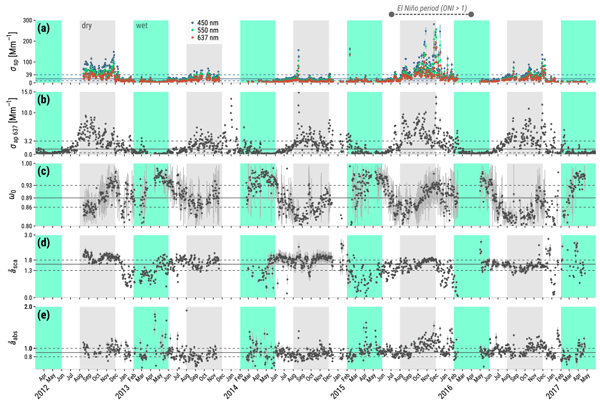 Further, this work is an illustrative example of the conditions and dynamics driving the transatlantic transport of African emissions to South America. This paper presents the aerosol and cloud condensation nuclei (CCN) variability for characteristic atmospheric states – such as biomass burning, long-range transport, and pristine rain forest conditions – in the vulnerable and climate-relevant Amazon Basin. It summarizes the key properties of aerosol and CCN and, thus, provides a basis for an in-depth analysis of aerosol–cloud interactions in the Amazon region. This study presents multiple years of aerosol coarse mode observations at the remote ATTO site in the Amazon Basin. The results are discussed in light of the frequent and episodic long-range transport of Saharan dust plumes in the early wet season as well as the persistent background bioaerosol cycling in the rain forest ecosystem. This work provides a solid basis for future studies on the dynamic coarse mode aerosol cycling and its biogeochemical relevance in the Amazon. The Amazon Tall Tower Observatory (ATTO) has been established to monitor the rain forest's biosphere-atmosphere exchange, which experiences the combined pressures from man-made deforestation and progressing climate change. This work is meant to be a reference study, which characterizes various geospatial properties of the ATTO footprint region and shows how the man-made transformation of Amazonia may impact future atmospheric observations at ATTO. This study shows the measurements of concentration of different monoterpene species in terms of height, time of day and season. Speciation seems similar during the dry seasons but changes with season. Furthermore, reactivity with the different oxidants demonstrated that a higher abundance of a monoterpene species does not automatically imply higher reactivity and that the most abundant monoterpene may not be the most atmospheric chemically relevant compound. Carbon dioxide and latent heat fluxes within the canopy are dominated by low-frequency (nonturbulent) processes. There is a striking contrast between fully turbulent and intermittent nights, such that turbulent processes dominate the total nighttime exchange during the former, while nonturbulent processes are more relevant in the latter. In very stable nights, during which intermittent exchange prevails, the stable boundary layer may be shallower than the highest observational level at 80 m.
Particles collected from the air above the Amazon Basin during the wet season were identified as Saharan dust. Soluble minerals were analysed to assess the bioavailability of iron. Dust deposited onto the canopy and topsoil can likely benefit organisms such as fungi and lichens. The ongoing deposition of Saharan dust across the Amazon rainforest provides an iron-rich source of essential macronutrients and micronutrients to plant roots, and also directly to plant leaves during the wet season. The paper presents a systematic characterization of cloud condensation nuclei (CCN) concentration in the central Amazonian atmosphere. 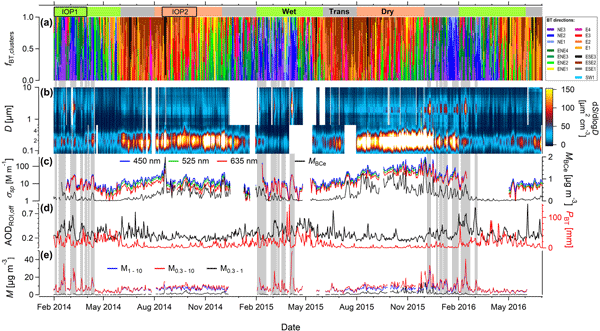 Our results show that the CCN population in this globally important ecosystem follows a pollution-related seasonal cycle, in which it mainly depends on changes in total aerosol size distribution and to a minor extent in the aerosol chemical composition. Our results allow an efficient modeling and prediction of the CCN population based on a novel approach. We use a chemical transport model to interpret observed aerosol concentrations and absorption over the Amazon Basin during the wet season. With daily temporal resolution for open fire emissions and modified aerosol optical properties, our model successfully captures the observed variation in aerosol concentrations and absorption over the Amazon Basin. The simulation indicates the important influence of open fire mainly from northern South America and from northern Africa in the wet season. Preliminary data from the ATTO project were analyzed to characterize the exchange of heat, water vapor, and CO2 between the Amazon forest and the atmosphere. The forest roughness makes estimation of their fluxes difficult, and even measurements at 42 m above the canopy show a lot of scatter. Still, measurements made around noon showed much better conformity with standard theories for the exchange of these quantities, opening the possibility of good flux estimates when the sun is high. This paper describes the Amazon Tall Tower Observatory (ATTO), a new atmosphere-biosphere observatory located in the remote Amazon Basin. It presents results from ecosystem ecology, meteorology, trace gas, and aerosol measurements collected at the ATTO site during the first three years of operation.